Baby wipes are disposable. The money you spent on them becomes disposable too. Here’s how to save on baby wipes. Found out what brands I use! I personally use Parent’s Choice, Walmart’s Brand of Baby Wipes, and Up & Up Target Brand. My baby doesn’t have problems with whatever I use. But I would like to share to you what the cheapest baby wipes are on the market. These are the cheapest wipes in my opinion. Sold at Walmart for $0.98 ($0.01225 or 1.2 cents per sheet), 80 sheets, unscented, resealable packaging. The thing is that these wipes tend to tear when you try to pull them forcefully out of their packaging, and sometimes the wipes are jumbled a bit in a stack, meaning you pull out one, the next sheet of wipe doesn’t automatically protrude out like other brands do. But remember, wipes are disposable, their purpose is to clean your baby, and these wipes clean well, they might not be as thick and as conveniently packaged as other brands, but you are getting you money’s worth: cheap disposable wipes. Up & Up Target Base Price is $14.49/800 sheets which is $0.0181125 or 1.8 cents per sheet. Target offers 5% when you sign up for delivery subscription for this item, and another 5% off if you pay with your RED Card (credit or debit), PLUS FREE SHIPPING. That’s a total of 10% discount. And so instead of paying $14.49, you pay $13.08 / 800 = $0.01635 or 1.6 cents per sheet (excluding tax), a total money saver if you choose to have monthly or once in two months supply of wipes. 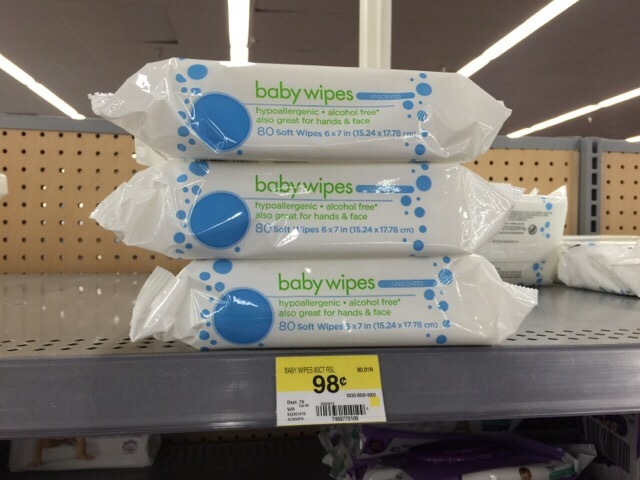 These wipes are decent and are better quality than Walmart Baby Wipes. It is thicker and more durable. Despite the bad reviews about it being rough on the skin (the previous kind of their wipes were reportedly softer), for me, they work just fine, I don’t find them rough, and the powder scented version smells nice. Although you can also buy the unscented version for the same price. Huggies and Pampers baby have a lot of variety, it was almost confusing for me to pick the cheapest of each brand for the price comparison. Let me know if you have any questions and/or suggestions, or if my calculations are wrong. The battle of the cheapest baby wipes has ended for me! Below is my second delivery of Up & Up Baby Powder Scented Baby Wipes.